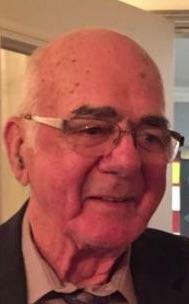 We, the family of John Edward MacPhee, are saddened to announce his passing on November 20, 2017 at his home of 80 years in French Road. Born at home, he was a son of the late Archie and Catherine (Gillis) MacPhee. He spent a long career as a lineman with the Sydney Steel Corporation. Aside from his work at the plant, he continued to run the family farm. He was a member of Sacred Heart & St. Margaret of Scotland Parishes; He was a founding member of the Mira Pasture Co-Op. John is survived by his wife, Carole (Nicholson); daughter, Moira (Bryan) Marks, Halifax; son, Sean (Catherine), Halifax; grandsons, Nicholas and Alistair; sisters, Mary Gillis, Grand Mira, Theresa (Murray) MacKinnon, Halifax and Sadie (Dennis) Kerr, Dartmouth; brothers, Fr Norman, Glace Bay, Danny (Liz), Sydney, Stephen (Judy), Ottawa and Allan (Mary), Dartmouth, and sister-in-law, Anna MacPhee. Visitation will take place 2-4 and 7-9 Thursday in Chant’s Funeral Home. Funeral Mass will be held 11 Friday in St. Margaret of Scotland Parish, Grand Mira. Fr. Paul MacGillivary and Fr Norman MacPhee presiding. Burial will follow in the church cemetery. Memorial donations may be made to The MacPhee Family Bursary of Cape Breton University. Online condolences may be sent to chantfuneralhome.ca.